In order to prevent your USB Drive from getting infected, you will need to create some files on your pen drive like Autorun.inf file and some other files which will later prevent the virus infection as these files being already created and cannot be deleted, so that virus or trojan cannot copy files and folders or create them on your USB Drive when you connect your drive to virus infected PC. 1. 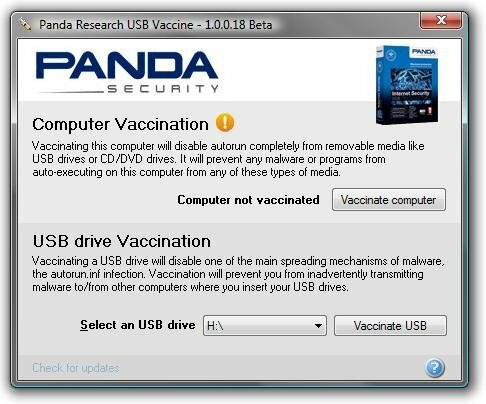 Panda USB Vaccine – It allows users to vaccinate their PCs in order to disable AutoRun completely so that no program from any USB/CD/DVD drive, It can be used on individual USB drives to disable its AUTORUN.INF file in order to prevent malware infections from spreading automatically. When applied on a USB drive, the vaccine permanently blocks an innocuous AUTORUN.INF file, preventing it from being read, created, deleted or modified. Once applied it effectively disables Windows from automatically executing any malicious file that might be stored in that particular USB drive. 2. 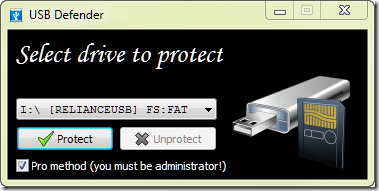 USB Defender – It was developed to be extremely easy in use. You can see just two buttons on it: “Protect” and “Unprotect”. First button you are using to vaccinate your drive, second – to remove protection.